This magazine case from Blackhawk contains space for two pistol magazines, each in their own divided holder. It mounts on a belt up to 2.25 inches wide, ensuring that you have a reload within easy reach, and versions are available for single and double-row magazines. It is made from a rugged four-layer Cordura laminate, and features hardened inserts on all sides to provide additional protection. It also includes a layer of closed cell foam that protects against impacts and keeps out water. Each side of the case comes with a snap-secured flap for greater coverage. The flaps include polymer stiffeners, making them quicker and easier to open. This is a great mag case. The inserts hold the magazines tightly. The flaps are adjustable. A great all around mag case. The only down side I could find was when used on a 2" belt it does slide around a bit. Other than that, it is one of the best mag cases that I have used. I would buy this again. 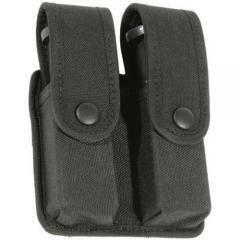 Great mag case easy access with snap closure. Like the plastic inserts for keeping shape and durability of case. What does the double row mean, does it hold 4 mags? Double row means double stack magazines. Holder holds (2) two magazines only.